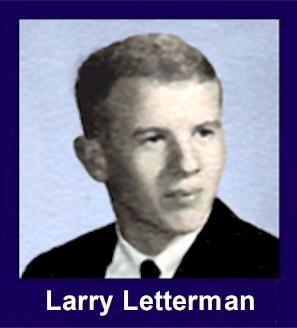 The 35th Infantry Regiment Association salutes our fallen brother, PFC Lawrence Allen Letterman, who died in the service of his country on November 13th, 1967 in Quang Tin Province, Vietnam. The cause of death was listed as Recoilless Rifle Fire, Securing Downed Chopper. At the time of his death Lawrence was 22 years of age. He was from Seattle, Washington. Lawrence is honored on the Vietnam Veterans Memorial at Panel 29E, Line 90. The decorations earned by PFC Lawrence Allen Letterman include: the Combat Infantryman Badge, the Bronze Star, the Purple Heart, the National Defense Service Medal, the Vietnam Service Medal, the Vietnam Campaign Medal and the Vietnam Cross of Gallantry with Palm Unit Citation. I remember that day well, the day you left us. As we rode in the chopper you gave me your feelings about the war. I knew then that you were one good person. You taught me a lot that day in the things you said. I got down off the chopper that was to be taken away. I walked over to you and we sat down on the rice patty dike. As we sat there and talked, I finally felt like I was part of the squad and your friend. I remember so well how you took me under your care and taught me the ways of Nam. Then the rocket hit as we sit there side by side. I hollered "lets head for cover" and took off. Then I realized that you were not behind me. I ran back to you.